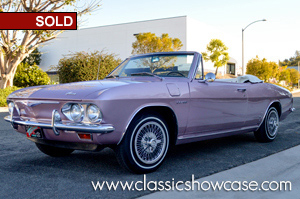 This beautiful rust-free Corvair Corsa Turbo 180 features a rare and exciting Evening Orchid Poly paint color that was only produced in 1965. It was originally purchased in New Orleans and spent most of its time where road salt is not an issue. It has a tidy and original undercarriage with a white interior giving it a retro look. The body was disassembled and restored in 2004 with a complete engine and transmission rebuild, as well as a fresh coat of paint. The Corvair was updated with a new ignition, choke and fuel pump with electronic versions, and the brake master cylinder was updated to a dual channel. All parts come with the car, along with extra trim and miscellaneous parts. The top was replaced in 2004 and has not been used much. It is powered by a 164 CI 6-cylinder engine mated to a 1966 4-speed manual transmission. The brakes are the same size as those used on the much larger Chevelle/Malibu’s, so you will find that stopping power is extremely impressive, even without discs. 1965 was a great year for Corvairs because the suspensions were upgraded to something very akin to that used in the Corvette. No more swing axles that were the cause of Nader’s consternation, but correct lateral links and coil springs to keep the tires planted properly. A 4-speed manual transmission is the only way to properly enjoy the turbo’s wondrous torque and it’s a joy to row it through the gears. It’s one heck of a car, even today. Fast, comfortable, agile, and stylish. This unique vehicle is a fun drive, offering a great opportunity to own a scarce air-cooled performance engine vehicle and would make a great addition to any Corvair enthusiast’s collection as it is highly collectible. The Chevrolet Corvair is a compact automobile produced by the Chevrolet division of General Motors for the 1960–1969 model years. The Corvair has the distinction of having been the only American-made, mass-produced passenger car to feature a rear-mounted air-cooled engine; The Corvair engine is an aluminum, horizontally opposed six-cylinder that produced 80 hp (60 kW) in 1960, but later versions produced as much as 180 hp (134 kW). Offered in a wide range of body styles, including two-door coupes and convertibles, four-door sedans, and four-door station wagons. The Corvair, like the Ford Falcon and the Plymouth Valiant were entries of a new compact car class. Corvair rebadged prototypes from Oldsmobile and Pontiac were built prior to the Corvair ‘s introduction, but weren't brought to production. The Corvair Monza, a five-passenger coupe with bucket seats was introduced late in the 1960 model year and found a new sporty-car niche. The Monza Spyder and later Corsa models were among the first American cars to offer a turbocharged engine.